No, I'm not listening to a Harry Nilsson album. But that song got stuck in my head as I was making this great Thia dish with coconut and lime. 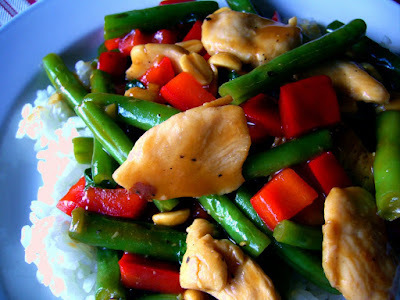 It wasn't a favorite of my husbands...probably because of the Oyster sauce and Anchovy paste...but I loved it. 1. Combine all ingredients for the slurry and set aside. 2. Season chicken with salt and pepper, then stir fry in 2 T. in a sauté pan over high heat for 3-4 minutes. Flip chicken and cook 3-4 more minutes. Remove and set aside. 3. Add another 2 t. oil to the same pan, add beans, bell pepper, and garlic. Stir fry 2 minutes. 4. Add chicken and accumulated juices and stir fry 2 more minutes. 5. Stir in the slurry mixture and cook 2 minutes to thicken and incorporate flavors. Remove from heat. 6. Stir in basil and jalapeno. Garnish with peanuts. 7. Bring broth, coconut milk, sugar and salt to a boil; stir in the rice. 8. Cover, reduce heat to low, and simmer 15 minutes, or until the liquid is absorbed. 9. Remove from heat and let sit for 5 minutes before stirring. 10. Finish with lime juice and butter. Fluff with a fork. *Coconut milk will sometimes separate in the can while sitting on the shelf. Be sure to open the can and mix it really well.